"Bridal suits are a popular choice among some brides!" They are the perfect alternative to wearing a bridal gown for second time brides and mature brides.You are not limited to white or ivory, but have many color options. They work well for informal weddings such as... court house weddings, back yard weddings, or weddings held in a garden or park are perfect opportunities to wear a special occasion suit as wedding attire. Even though they are becoming popular they are not easy to find.On this page you will find shopping resources and tips. Most of the wedding suits you see pictured can be purchased at your local bridal shop. You can go in with the name of the designer and the style number and place an order. Most shops will have a limited selection of styles and sizes to actually see. Order far in advance of the wear date. It takes anywhere from 3 to 6 months for something to come in from a designer. Pick styles that are similar to something you have worn before that was complimentary to your figure, since most of the time you will not be able to try on the bridal suit. Go with a style you know usually works for you. Make sure to allow time for alterations. There are no refunds or exchanges for these special orders, so make sure you are happy with your choice before ordering. 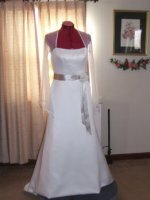 You can also purchase your wedding outfit from an online discount bridal shop. These online stores sell the same merchandise that your local bridal shops carry but for a cheaper price. Do your research before going this route. There are some reputable sites out there but there are also some that make "copy cat" versions of designer's clothing also. Make sure you are ordering domestically and not from an "off shore" wedding site. You still need to follow the same ordering guidelines and time tables the bridal shops follow. Make sure to order far in advance of your wedding. Another affiliate of this site is WomensSuits.com. They have an array of, very stylish suits that can be used as a wedding suit, a mother's outfit and for other special occasions. Some of the suits they carry are in the shop at the bottom of this page. You can also find bridal suits at your local department stores. But you will find more of a selection on their websites. Try Dillard's, Nordstroms, Macys, Bloomingdales and JC Penney. Look in their special occasion departments. If you don't find anything in your local store, some of these stores have websites. They sell items not available in the stores on the sites, so make sure you take a look there. The best time of year to find a large selection of these types of outfits in department stores is during the holiday season at Christmas time and Easter. Go to your local Macy's and Macys.com a retail affiliate of this site, where you can find special occasion wear that can be used for bridal from dressers to suits. Bloomingdales's also and affiliate, has an online wedding shop of dresses and gowns for you!